Anna Eleanor Roosevelt was born October 11, 1884, into a socially and politically prominent family with a distinguished heritage. Her father was Elliott Roosevelt, President Theodore "Teddy" Roosevelt's younger brother. Her mother, Anna Rebecca Hall came from a family of wealthy New York landowners. Eleanor was an awkward child and her serious nature puzzled her mother. Unlike Anna, she wasn't beautiful. Eleanor later recalled, "I was always disgracing my mother." Although he adored her, her alcoholic father often disappointed Eleanor. Anna died in 1892 and Elliott two years later. Eleanor was only 10 when she and her two brothers were placed in their grandmother's care. At 15, she was sent to England to attend Allenswood. The school for privileged young women emphasized social responsibility and independence. 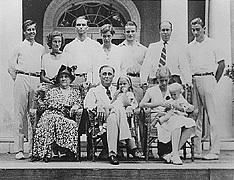 On her return home, Eleanor became engaged to her fifth cousin, Franklin Delano Roosevelt, son of Sara Delano and James Roosevelt. The wedding was held in New York City on March 17, 1905. President Teddy Roosevelt gave the bride away. Eleanor once said, "The first 10 years of my marriage I was either having a baby or getting over having a baby." Eleanor and Franklin had six children, five reached adulthood. In 1910, Franklin was elected to the New York State Legislature. He was appointed Assistant Secretary of the U.S. Navy in 1913. In 1928 he was elected Governor of New York. In the 1920s Eleanor became increasingly active in Democratic politics and she recognized her aptitude for public service. Eleanor and Franklin developed a unique and productive relationship.